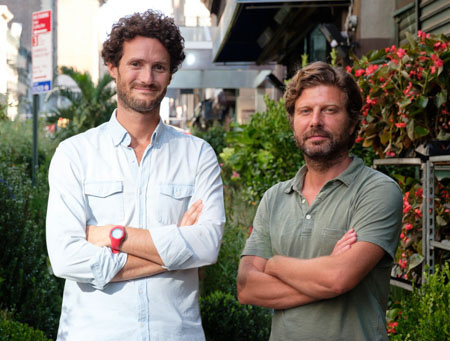 We’re Louis and Olivier, co-founders of Ode à la Rose. Many years ago, we moved to New York City from our native France to pursue careers in one of the most poetic, colorful, and uplifting industries: banking. We were thrilled to explore a new city, going on exciting adventures, and making friends along the way, but soon came up against a thorny cultural difference. We weren’t falling in love with the flowers we met here, and we mean this literally. In France, flowers aren’t just something you send; they tell a story on your behalf. From the variety to the number of stems, from the color choice to the composition, bouquets carry meaning, heart, and passion. Picking the right one is a tall order! We launched Ode à la Rose in 2012 to share this part of our culture, and to celebrate our deep appreciation for beauty, elegance, and everyday pleasures. Now we no longer have to wear suits, and we get to help people express their feelings the floral way. It all begins with the flowers, obviously. Ours come straight from the best eco-friendly farms in Ecuador, Colombia, and the Netherlands so they can make a long-lasting impression. Our highly talented in-house artisans have years of floral design experience, and use seasons as inspiration to design beautifully unique bouquets. At Ode, every detail is carefully considered so that you can send a thoughtful message of affection, congratulations, or sympathy in just one click. When in doubt, our dedicated team is always available to suggest the perfect bouquet for the occasion. Discover more about the Ode difference here. Feel free to ask us any question, any time. We know the story behind every petal in our New York City and Chicago ateliers.